A blog about Michael Cnudde's novel, War Plan Crimson, A Novel of Alternate History and his other works of fiction. Also features reviews and rants on all things alternate history. Full confession here: in my initial post discussing this novel, I referred to 1945 as “odious.” Well, I may have a retraction to make. Upon finishing my second reading, I found myself rather enjoying this novel – with one big caveat, which I will explain later. I always had to hand points to authors Newt Gingrich and William R. Forstchen for asking this intriguing question: what if Hitler didn’t declare war on the United States following the Japanese bombing of Pearl Harbor? Contrary to what many may think, there was no treaty obligation that forced Germany to declare war. When Hitler declared war on the U.S., on December 11, 1941 he granted FDR’s most desperate wish to enter the war on the side of Britain against Germany. In Gingrich and Forstchen's alternate history, the authors posit Hitler being involved in a plane crash that puts him into a coma, just after Pearl Harbor. In his place, a junta of German generals takes control, first pulling their troops in more defensive positions on the eastern front, second, signing an armistice with exceptionally easy terms with the British, and third, and most importantly, not declaring war on America. By the time Hitler had recovered enough to take power again, the Soviet Union had been defeated and Nazi Germany was victorious. Meanwhile because the United States is able to pay its full attention to Japan, the Great Pacific War, as it is called, is fought and won on a shorter timeline. It is not clear however, while the authors state the atom bomb is not ready for use by 1945, how that war is finally ended though. By the end of the Pacific War, the United States and Nazi Germany are eyeing each other across a narrowing Atlantic Ocean. When word of a Manhattan Project that will shortly bare fruit reaches Berlin, the Nazis launch a desperate plan. That’s as far as I will go as I will not be dropping spoilers. 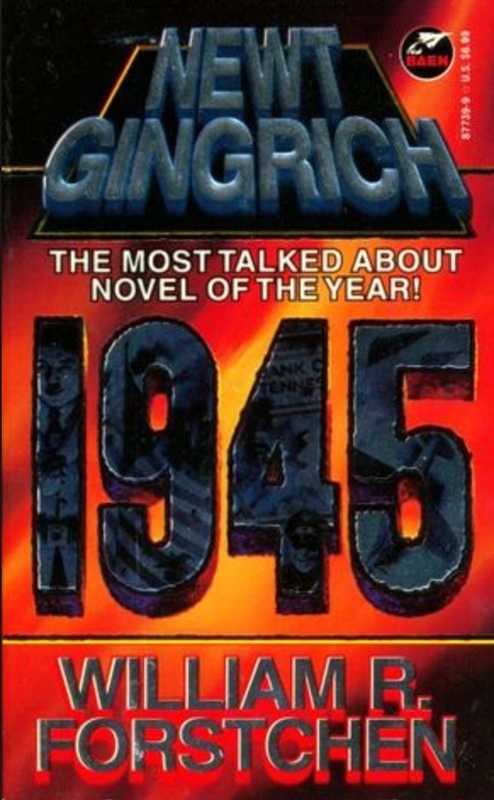 Against Gingrich’s and Forstchen’s fast-moving plot and generally well-drawn backdrops, characters, both historic and fictional, are introduced. Once again, these characters when to compared to those in similar genre novels, are generally well-handled with good developmental arcs. However, the dialogue sometimes falls into modern techno jargon which unfortunately, does not ring true. …the problem being, it never was continued. Although the authors had apparently mooted a sequel entitled, Fortress Europa, this, for whatever reasons, has never seen print. As I said, very infuriating. So that’s it. If you think you can read a book that has a cliff-hanger ending that leaves you hanging, go ahead. On its own merits, 1945 is a very good book; however, it’s the follow-though that is exceptionally lacking and therefore disappointing. If like me, you can sketch out in your mind’s eye, what would happen afterwards, again, this book might be for you. I’ve developed a pretty good sequel in my own head; if either author wants to reach out and kick it around with me, they know where to find me. In the meantime, you can help out a poor unemployed writer by purchasing Elvis Saves JFK! for just 99 cents and War Plan Crimson, A Novel of Alternate History, for $2.99 and now The Key to My Heart, also $2.99 (all are free to preview). All books -- which are already on Smashword's premium distribution list -- are also available through such fine on-line retailers such as Sony, Chapters Indigo, Barnes & Noble and Apple's iTunes Store. Thanks.